A few weeks have passed since my last post. After quickly scarfing my plywood and cutting out the boards I thought I would really start making some visual progress. Hull planking reading to be fit. “NOT” Seems that fitting the boards is more time consuming then it looks. It takes a number of false fittings and checking of angles and bevels to make the proper fit. 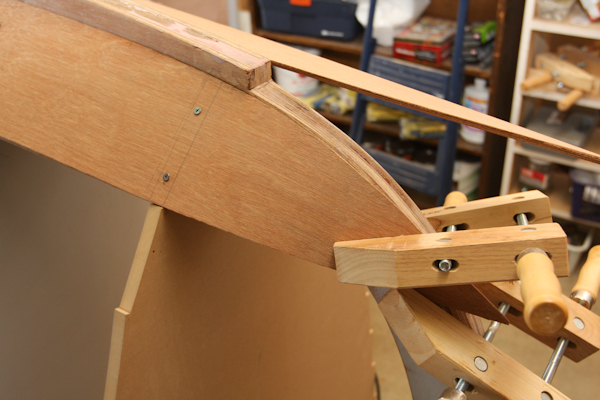 Also I had to do a fair amount of board fairing towards the stem to allow for the proper bend. My first board was not a good as my second, and my third has been harder then my first. These screws are removed after epoxy has cured. 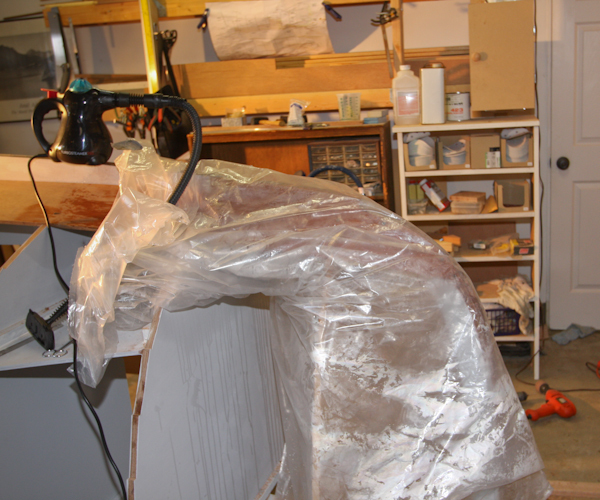 I had such difficulty with the bending of the garboard that I used a steamer to soften up the wood. This worked, and I was able to get a fair bend, but after more thought and a check on the Internet.. It’s not a good idea to steam bend glued plywood. The glue can be compromised if subjected to a lot of heat. I was able to get good results with my steam tent and about 10 minutes of steam soaking, and I don’t think I damaged the glue, as it took the bend more naturally and cleaned up very well after drying, epoxy gluing, and sanding. 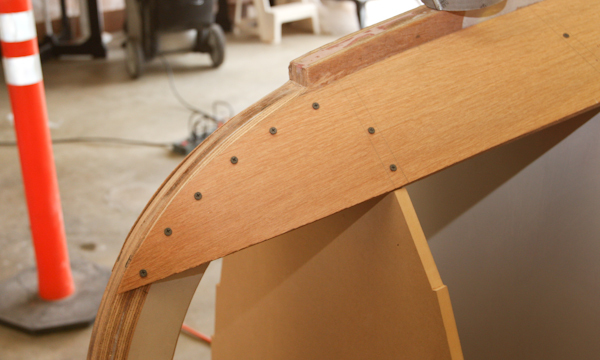 There was also no hint of any delamination in the thinner sections of ply. Worked well, but not recommended on glued plywood. Not recommended on plywood, but worked well to set bend before epoxy. 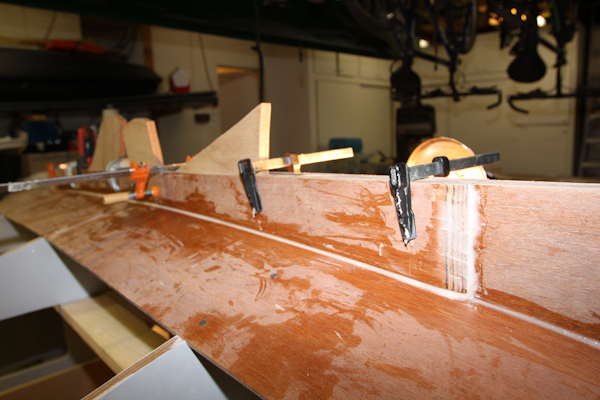 After finishing the garboard installation I adding epoxy fairing to the stem joints and attached the additional support board around the centerboard case opening on the keel. 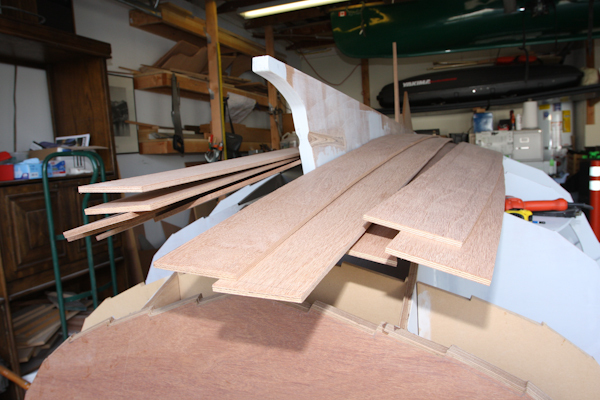 I found that after turning the boat over for planking the centerboard opening had compressed or bowed inward. 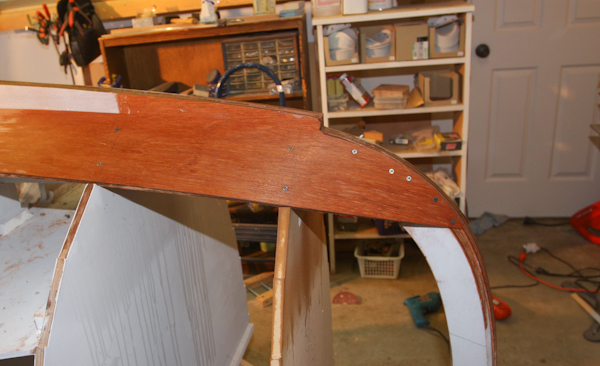 This bowing was over an 1/8 inch and could have compromised the smooth operation of the centerboard if left uncorrected. The plans call for this supporting plank to be installed in this area, and I had corrected the opening to the correct width for the prior two weeks with the correct thickness spacer. 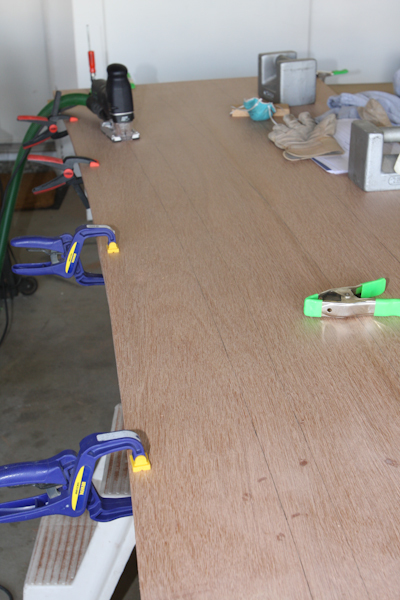 Once this support board was installed the epoxy cured and the opening is now fair and at the correct width. Verify no bowing in of center board slot when this support is attached. I have been working for the past three days on the third board. I haven’t been able to get the correct bend in the board at the stem. Once I made more substantial bevels to the forward bulkheads, and made up a group of board clamps I was able to finally get a good fit. 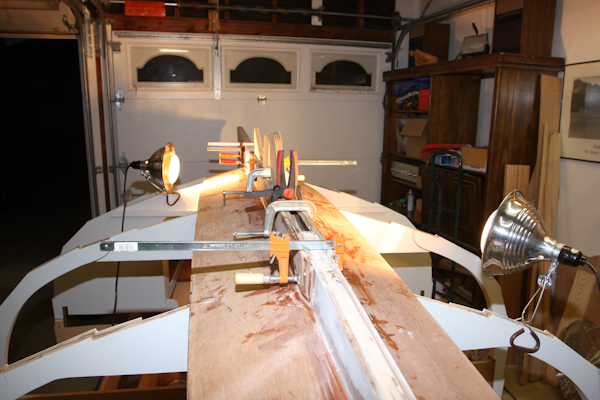 This photo shows the board in the proper position prior to epoxy gluing. I am using the board clamps to hold the board in proper position and using mechanical clamps on the stem. A few backing blocks are used as anchor points for the clamps too. More screw points will be added too before disassembly and gluing. Keep up the great work! Your progress is amazing. I can imagine a great deal of satisfaction from working with the wood and tools. 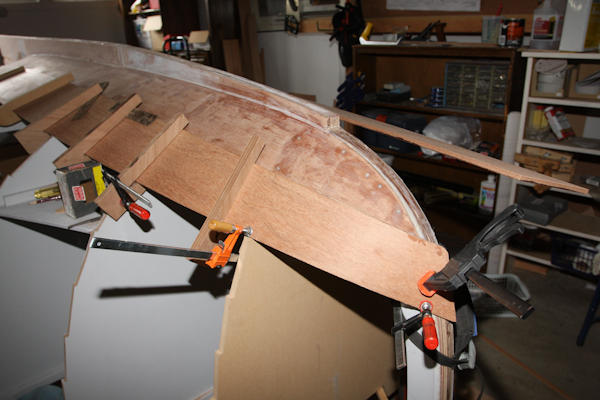 The best part of building a boat without a construction due date, is the joy of taking 20 hours to do a two hour job. This is the point where I would have simply glued and added appropriate amounts of Spackle to fill in my mistakes. Where you get it right. Of course I’d be sailing already! (and sinking).